Glossy Ibis Flying Over Morris Arboretum. 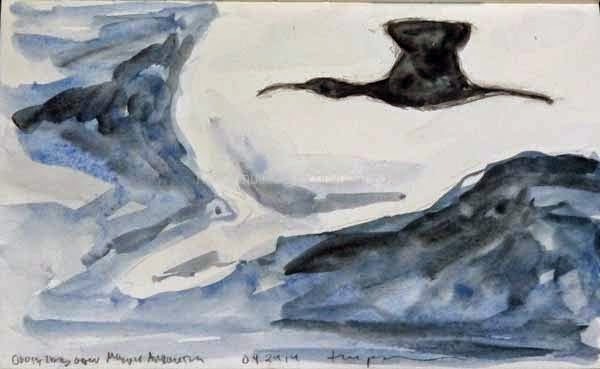 Watercolor Sketch by Ken Januski. The easiest way to bird, and to see unusual birds, is to arrive somewhere, state that such and such a rare bird might be around and then find it. Of course this method is not guaranteed to work all of the time, or even most of the time. But it's nice when it does. When Jerene and I arrived at the wetlands of Morris Arboretum on Sunday we saw a very high soaring bird. It turned out to be a Great Blue Heron, not an unusual bird for the wetlands. But it reminded me that someone had recently reported seeing some Glossy Ibis in Pennsylvania. So I said to Jerene that we should keep our eye out for them. We've never seen them in flight here but they are a common sight in Cape May, NJ this time of year. We've seen a lot of flyovers over the wetlands. I'm not sure if this is because it's just a large open space, with plenty of room to see what's above you, whether it's due to the appeal of the pond, or perhaps something else. Morris is very close to the hawk watch at Militia Hill in Fort Washington State Park. Perhaps it's just a particular flyway. In any case it made me think that a Glossy Ibis was a possibility, though a rare one. Soon after we saw the Great Blue we ran into some birders and I repeated the idea that we'd never seen a Glossy Ibis there. But it didn't seem unreasonable. Less than an hour later, while I was trying to find what I thought was a singing Yellow Warbler Jerene said 'I think that's a Glossy Ibis.' Sure enough very high above us, but still clear enough to see, was a Glossy Ibis. I tried to get some photos but found it very difficult to focus at such a distance. Still I did get one that was good enough to serve as the model for the small watercolor study above. The second easiest way to bird, and one that is a bit more reliable, is to just sit still, perhaps start talking to someone or sit down and just look around. That was the case yesterday at Carpenter's Woods. As I talked to someone about local birding and other things first my first of year Black and White Warbler appeared nearby and then my first of year Yellow Warbler appeared. The Yellow Warbler also solved a mystery. Earlier I'd seen a strikingly yellow bird high in the canopy. I was sure it was a warbler but I couldn't figure out which one. The visual clues didn't add up to a specific species. Once we saw the Yellow Warbler I was pretty sure that's what it was, even though it was far higher than I'm used to seeing them. When I got home a distant photo confirmed it. Numerous times I've seen late fall Ospreys, a fairly unusual bird, fly by while I was talking to someone along Forbidden Drive in the Wissahickon. The best look we've ever had at a Golden-winged Warbler occurred as we sat and had lunch on a log near a Witch Hazel at the Pocono Environmental Education Center. Many birders know this but it often looks like few practice it. But we continue to practice and enjoy the Sit Still method of birding. Because it's such a busy time of year, between newly arriving birds, newly flowering wild flowers and a garden that needs planting I'm not doing much art now. But inspiration is accumulating every day. Eventually it will appear in my art. Blue-gray Gnatcatcher. Ballpoint Pen Field Sketch by Ken Januski. Blue-gray Gnatcatcher, American Robin and Wood Thrush. Felt-tip Pen Sketch by Ken Januski. Unexpected home repair projects have forced me to miss almost a week of migration birding recently. I hate to miss seeing the first birds of the year but the work was also something that needed to be done. Because I've been so busy with the home repair I still haven't posted the finished woodcut of the Blackpoll Warblers in the Swamp Dogwood. I'll post it at bottom of page. After I did finish it and before I knew about the need for the home repairs I made a quick foray to the Manayunk Canal. There I saw my first Blue-gray Gnatcatcher of 2014. I think perhaps only birders can understand how thrilling it is to see the first of a species for the new year. It really is like welcoming long lost friends. I have a long history of NOT being able to do a good sketch of them. 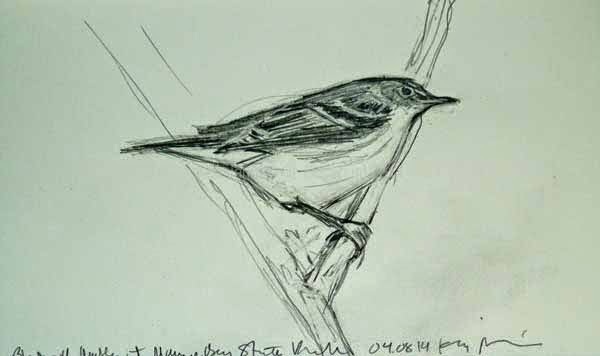 I recall the big eye and long tail and don't manage to see much of anything else or put it down on paper. 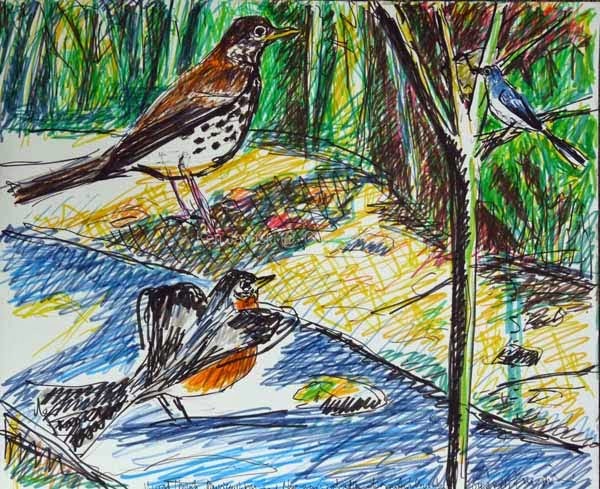 Immediately above is a large felt-tip pen sketch of birds seen at nearby Carpenter's Woods a few springs ago: an American Robin bathing in a small stream, a Wood Thrush near him and a Blue-gray Gnatcatcher on a nearby shrub. 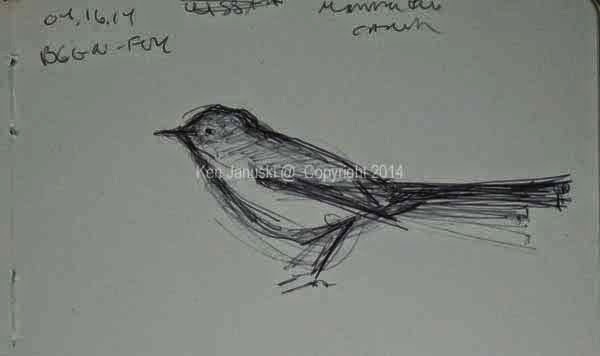 I like the sketch except that the Blue-gray Gnatcatcher is all wrong. So this year when I saw my first one I decided to try to concentrate on it and sketch it. At top is the result. It's still far from satisfactory. But each year shows improvement. Between it and photos I'm tempted to do some more sketches of Blue-gray Gnatcatchers. Then I'd really like to revisit the felt-tip pen sketch. Perhaps it can be redone as a woodblock or linoleum block. While I've been stuck inside I've seen reports of warblers and other birds arriving in Philadelphia and other parts of PA. I hate missing them but will get the chance soon. One thing I've done in the meantime is to listen to the bird songs and calls of warblers that accompany the newly published The Warbler Guide while looking at the sonograms in the book. Sonograms are a newer method of learning to know the songs, based on a visual picture of the song rather than various mnemonics such as 'Sweet, Sweet, I'm So Sweet' of the Yellow Warbler. Bird songs can be hard to learn but learning them can be incredibly important and enjoyable. I've written before about the excitement of stepping into the woods and recognizing 5-10 different species as I take my first step based completely on their songs. It really is thrilling. I first ran across the notion of sonograms, though spelled sonograms, in The Singing Life of Birds by Donald Kroodsma. I never mastered it from that book but it certainly did intrigue me. 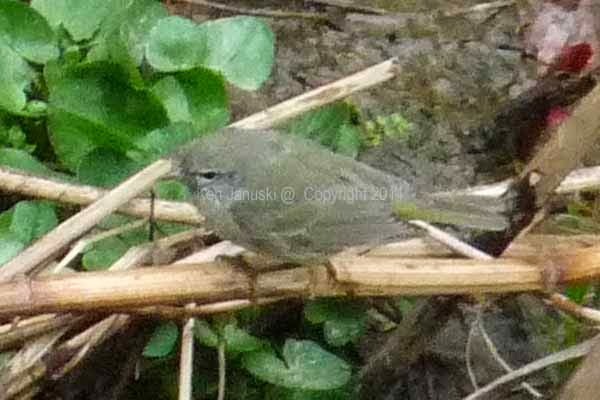 The new warbler guide and its songs seems to make it much easier. And speaking of that book The Delaware Valley Ornithological Club has a special warbler workshop featuring the authors this weekend at John Heinz NWR and Belleplain State Forest in New Jersey. I'm not sure if we'll make it there but it should be very exciting for anyone who can. Finally, before rambling too far afield, I wanted to post the final version of the Blackpolls in Swamp Dogwood print. It is a very small edition and I have only a couple of prints for sale on Etsy. I did debate adding another yellow color on top but decided that it would make the print even more complex. I'm happy with this just as is. Though it may not look it this is based on an actual experience. I'm quite happy being able to transliterate real experiences into art. Fall Blackpolls in Swamp Dogwood. 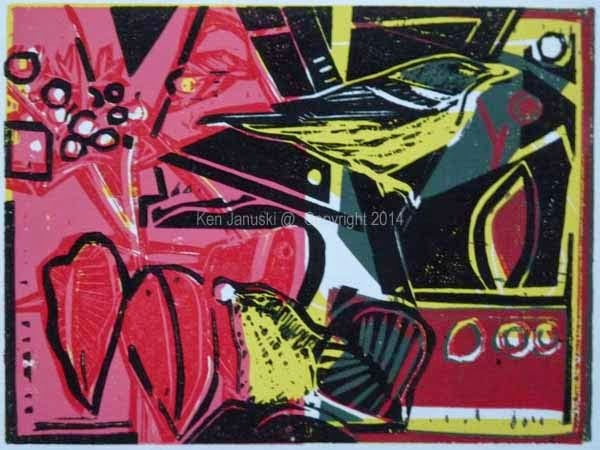 Multi-block Woodcut by Ken Januski. Would Stuart Davis Be Pleased? Blackpoll Warblers and Swamp Dogwood. 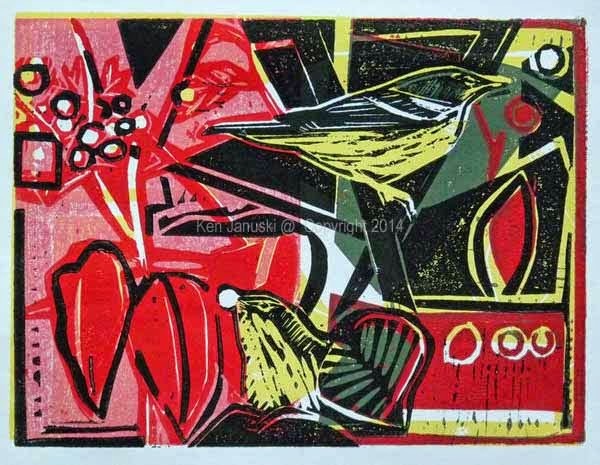 Five-color Woodcut Proof by Ken Januski. Well I hope so! During my many years as an abstract artist the American artist Stuart Davis was at the top of my artistic pantheon for many years. There was something so vibrant and alive about his work, though he never really reached the heights of fame and appreciation that I think his work deserved. I wasn't really thinking of him with this woodcut or the last one. But when I pulled this proof a short while ago, black on top of four other colors my first reaction was: Stuart Davis! Right now I'm very happy with this print. In the cold light of day however it may no longer look so good, nor so much like Stuart Davis. But my guess is that I'm going to remain happy with it. 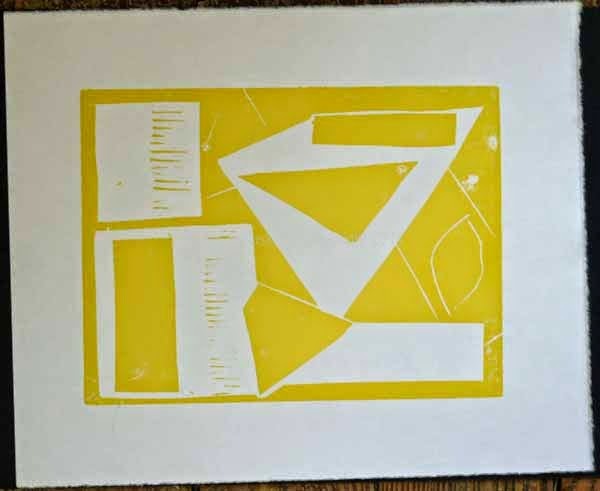 At that point I'll need to decide whether to overprint the yellow block, the very first one, as I've thought about doing. Right now my inclination is not to, though I may just have to try it on a proof, just to see what it looks like. If I don't then I'll print the black on good paper and be done. All the other colors have already been printed on the Shin Torinoko paper. In my long artistic journey as a bird/ wildlife/nature artist I've continually sought to be honest to birds and nature while still making art that doesn't look like its from 200 years ago. Right now I feel like this is close to accomplishing that. Then again, there is the cold light of day lingering around the corner. Blackpoll Warblers and Swamp Dogwood. 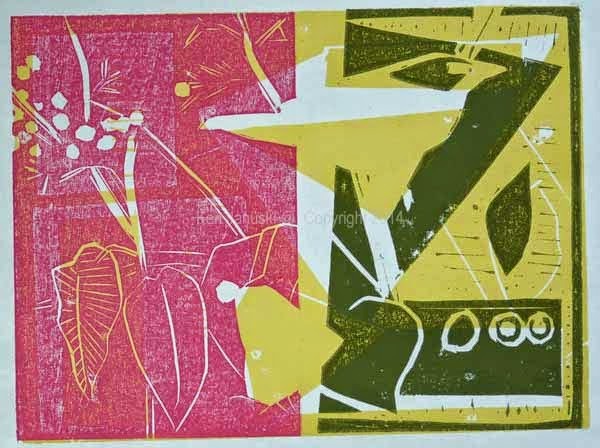 Four Color Woodcut Proof by Ken Januski. One more beautiful day and I've been inside the entire day, working on this print. Oh well. If I didn't enjoy it and it wasn't important I would have delayed it and gone out and enjoyed the day. We have a couple of 2.5 year old cats that tend to get into trouble, especially recently. My wife jokingly rationalizes this by saying that they're 'splorin, a contraction for exploring. Well I hate to be lumped in with those little troublemakers, but I too am 'splorin. This entire print is an exploration. That is both the fun and the challenge of it. The top print shows the print in its most finished stage so far. But the black that is supposed to unify it and define the two Blackpolls dominates the print at this point. Tomorrow I need to make some final decisions on the bottom proof. Once I do I'll print the third color on good printmaking paper. Then the real task will remain - deciding how much black to remove. And then deciding on whether or not to reprint any of the other three blocks on top of the black. I'm very tempted to print the first yellowish block. That will both tone down the black on the breasts of the Blackpolls and turn some of the pinks and roses a bit more orangey. At least that's how I visualize it. Blackpolls and Swamp Dogwood. 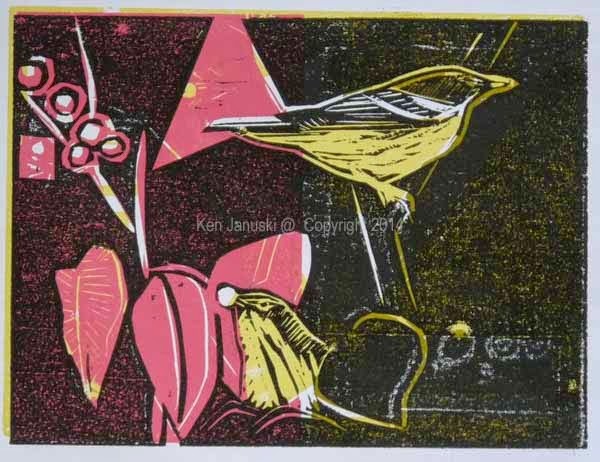 Yellow on Black Woodcut Proof by Ken Januski. Blackpolls and Swamp Dogwood. 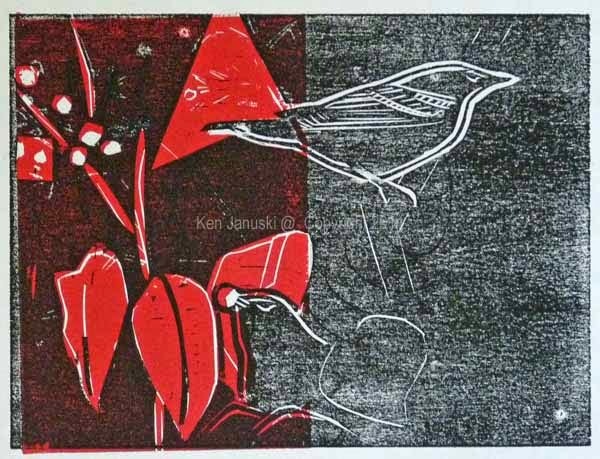 Red on Black Woodcut Proof by Ken Januski. The first warm weekend in spring is here and I'm inside working on this Blackpoll and Swamp Dogwood print. But that's fine. We birded early this morning, seeing our first American Kestrel of 2014, and then this afternoon I've been glued to my chair carving woodblocks and proofing them. As I said this is very improvisatory, even more than the last mergansers and grebes multi-block woodcut. That leaves a lot that can go wrong. But it also leaves some room for excitement. Above I tried two proofs, one of a yellow block on top of the black block and the next of a red block, just half the size of the black block printed on top of the black block. I'm starting to see possibilities and excitement. However part of the excitement is transitory. I don't plan to print yellow or red over black but in fact the opposite. So most likely the print will never really look that close to the two proofs above. Blackpolls and Swamp Dogwood. 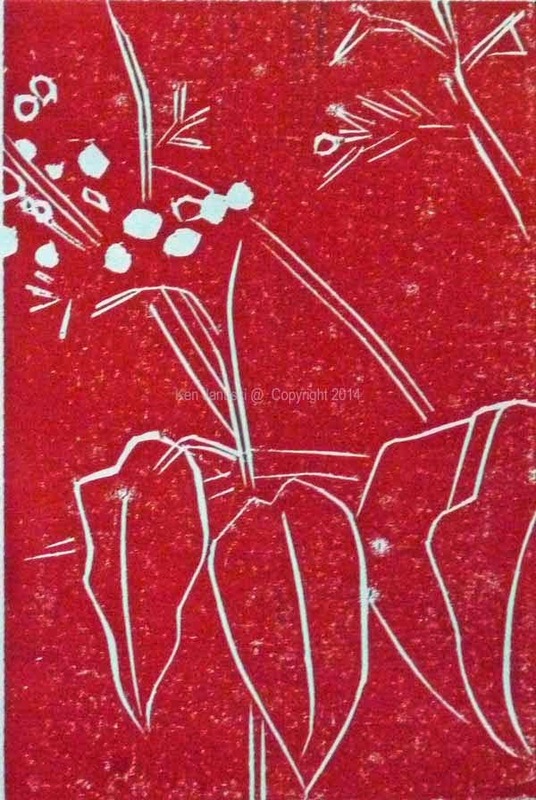 First Stage of Multi-block Woodcut by Ken Januski. Above is the first color printed on good paper, Shin Torinoko. Here you can see that the yellow will be the bottom layer of color. But I do like the greenish effect of black over yellow. So tomorrow I'll proof some black, and red on top of the yellow block. If I like it I'll proceed. If not I'll have to leave somewhere in my plans for these four wood blocks (that's right I haven't mentioned the fourth yet) to reprint some of the yellow block over the black. This sounds for more complicated than it is. Hopefully it will start to come together soon. I think the two proofs at top at least give a hint of just where it might go. In fact it's a bit like a warbler, ready to flit off in any direction at any moment. Bloodroot and Hellebore. Photo by Ken Januski. I think nothing speaks of spring more than wildflowers poking through the leaf litter. In a certain sense it is the perfect metaphor for spring. Out of the drab leaf litter that covers the ground, and looks so unpromising, ephemeral wildflowers optimistically poke their way through. And before you know it they'll be gone. With these Bloodroot flowers in our side yard we can always count on rain or hail wiping them out within a day or so of blooming. I always associate the earliest warblers with Bloodroot, Mayapples, Skunk Cabbage, Virginia Bluebells, at least in our area. 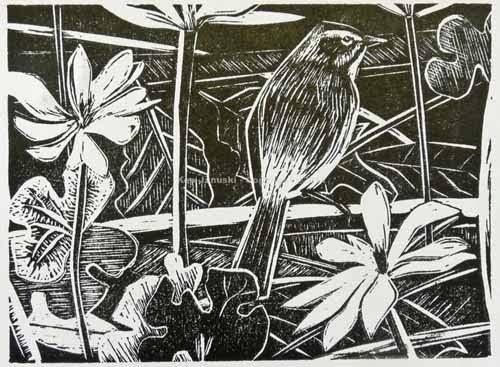 After seeing some Palm Warblers and blooming Bloodroot at the Schuylkill Center for Environmental Education a few springs ago I couldn't resist making a linocut print out of it. I've shown it before but here it is again. It remains a favorite of mine. Sad to say though we've never had a Palm Warbler in our yard, at least not one that we've noticed. 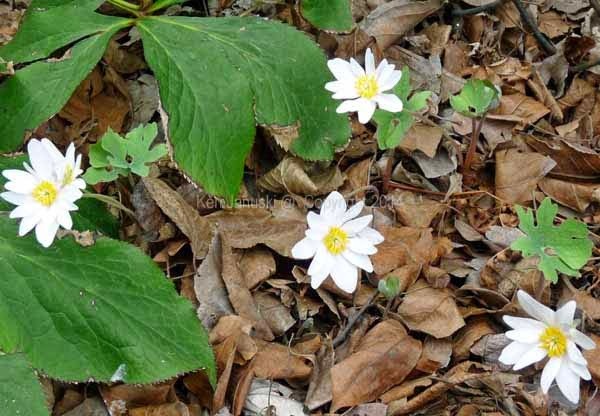 But each year the striking white flowers of our Bloodroot put on a short but splendid show, just waiting for our first Palm Warbler. 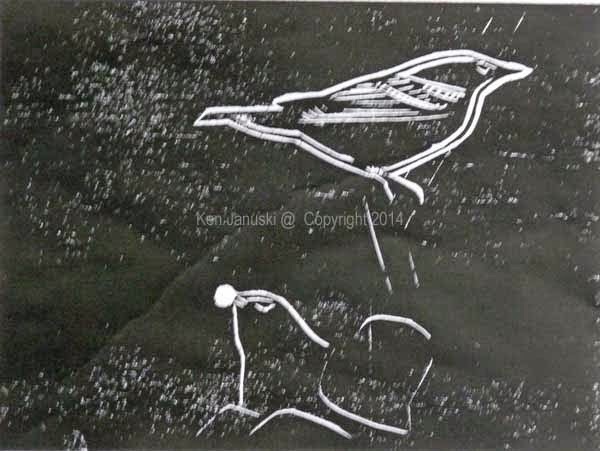 I've finally begun a multi-block woodcut based on the watercolor sketches I showed in the last post of a Blackpoll Warbler, or two, amidst the striking Swamp Dogwood, seen last fall at Maumee Bay State Park in Ohio. As with the last print this will be quite improvisatory. Below is the start of the black block. Most likely it will be the last block printed. 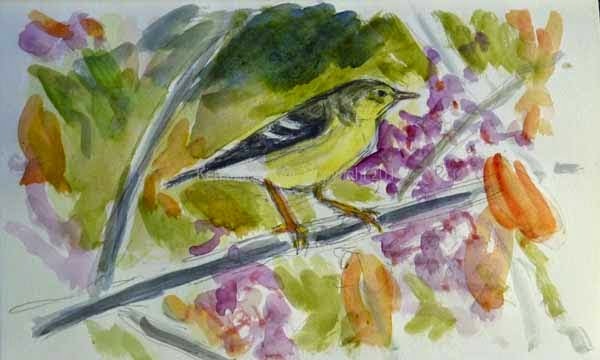 Blackpoll Warblers and Swamp Dogwood. 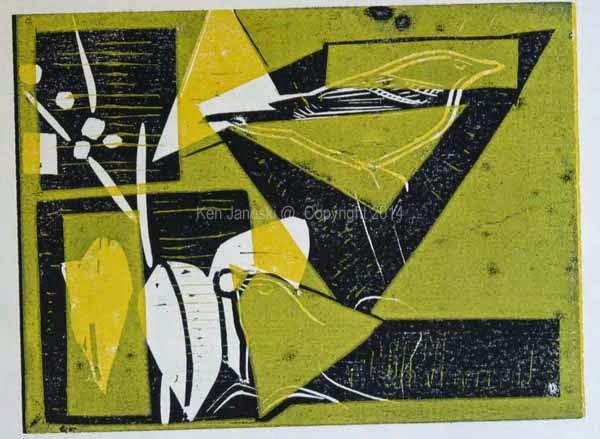 First State Proof of First Block of Multi-block Woodcut by Ken Januski. Below is the red/pink block. It is half the size of the black block and will print on the left side of the black block. There will also be a block of the same size that will print on the right side of the black block. And most likely I'll flip the black block over and also print on it. Who knows where this will lead? But I do think it's the direction I need to go. There is just too much safe, predictable wildlife and bird art there. I for one want to try something different. 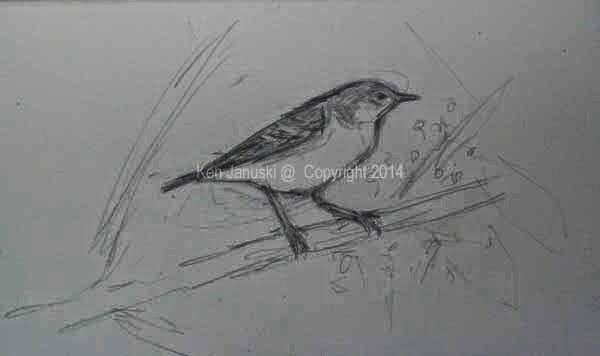 Perhaps it will appeal to art lovers if not to lovers of bird and wildlife art. Or it may just be a mistake. Either way it's something that I need to try. Blackpoll Warblers and Swamp Dogwood. First State Proof of Second Block of Multi-block Woodcut by Ken Januski. 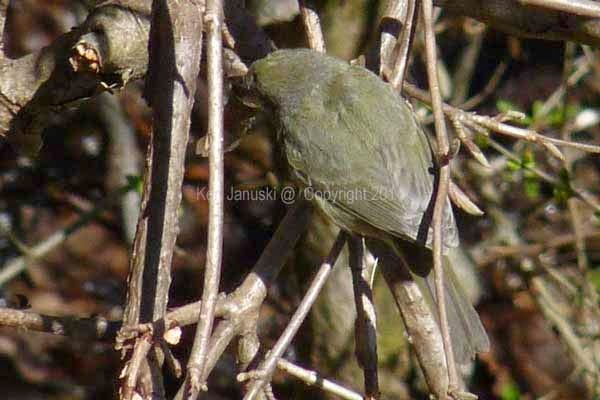 Yes you would have a good right to question my honesty if I told you I recently saw this warbler. But there are some hints that it is fall and not spring due to the orange leaves, or should I say suggestion of leaves. I'm working on ideas and sketches for a new somewhat abstract woodcut, similar to the one of the grebes and mergansers. Part of my idea in what I hope will be a series of such prints is that I needn't be limited, at all, by verisimilitude. I've always known this but it was reinforced recently while listening to a very lengthy introduction to music from The Teaching Company. Music is of course the most abstract of the arts. It rarely is meant to represent something. But I was shocked to read about something, from the Renaissance, called non-imitative polyphony. In it two different themes are sung at the same time, creating counterpoint or polyphony. Often this was done with masses and in fact got to the point where there was a reaction against it. So though one theme might be a recognizable song, often from the mass, the other, played at the same time, might be the most secular and non-religious of songs. I'm a beginner to music history to I hesitate to say more because I'll inevitably get it wrong. But what struck me was that about 500 years ago composers felt free to experiment with even such solemn things as masses for decorative and emotional effect. There always was and always will be the desire on the part of artists to experiment. Even 500 years ago!! Some musicians of that time felt free to mix and match in seemingly the most outrageous ways. Why I can't say for sure but I'd guess for artistic effect and expression. 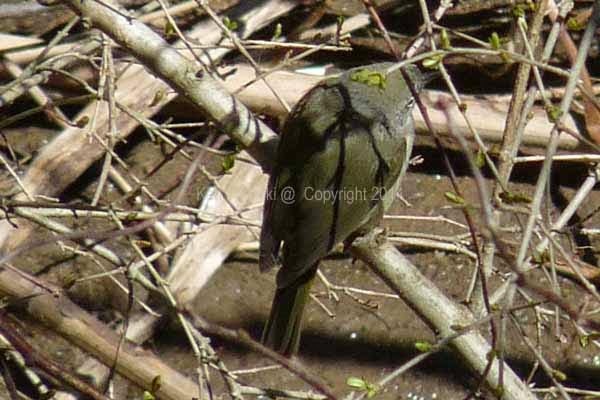 What does this have to do with the visual arts, and particularly that fall Blackpoll Warbler seen among the Swamp Dogwoods at Maumee State Park? The sensation of color. What stuck with me more than anything else were the subtle colors of the warbler AND the pink/rose color of the Swamp Dogwood. There was an overall color harmony that was and is my most striking memory. So just like non-imitative polyphony I'm going to take great liberties with the warbler in the interest of an overall color sensation. 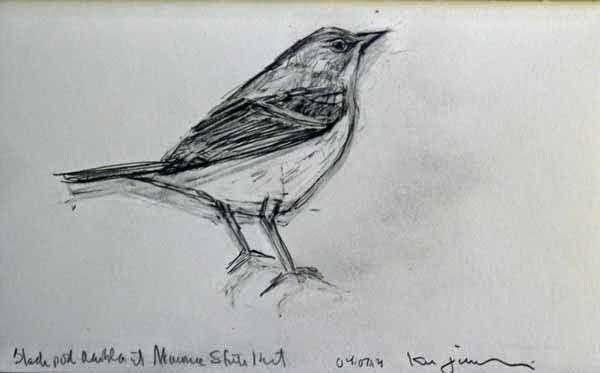 The problem with this of course is that I could get so abstract so quickly that it would be easy to lose all moorings, all sense of connection to the warbler itself. 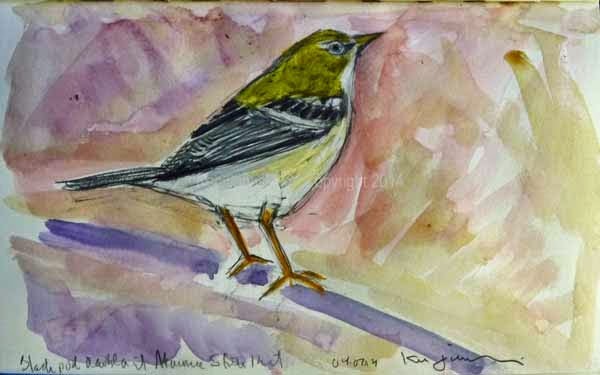 Blackpoll Warbler. Pencil Sketch by Ken Januski. Blackpoll Warbler. Watercolor Sketch by Ken Januski. That is where shape comes in. Many authors of bird field guides talk about the importance of shape in identifying birds. That's absolutely true. I recently had the pleasure of watching David Sibley discuss his working methods in a talk about the second edition of his famous guide to birds. He said that he might look for 15 minutes or so before spending less than 30 seconds putting down the shape on paper. Details he could get later from photos. It was the shape that was important. It is shape I think that gives life and individuality to birds. It's also one of the most pleasurable aspects of drawing. Sometimes when I'm sketching something it seems that there is nothing else of equal enjoyment in art. I felt that as I drew the three sketches of Blackpolls I'm showing here. I deliberately took photos of them before I added watercolor so as to accentuate the drawing itself. In any case I think that shape can be an anchor in a more or less abstract painting or print. That is what I tried to do in the mergansers and grebes print and that's what I'll try to do if I make a print from the blackpolls. At the moment I'm just sketching trying to get a good sense of their shape. At some point I'll try to merge that with a much more abstract rendering of the pinks, oranges, and subtle yellow of the Blackpoll that I remember so well. Orange-crowned Warbler along the Wissahickon. Photo by Ken Januski. 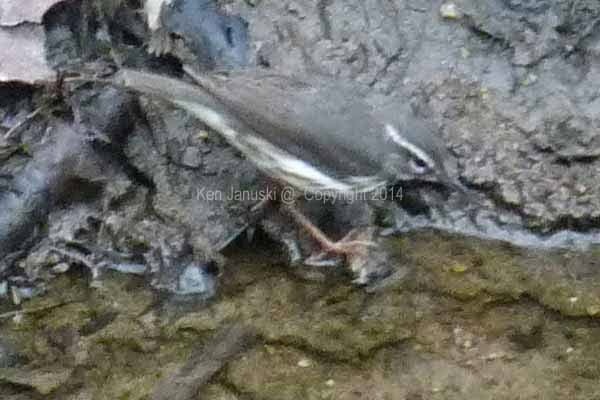 Louisiana Waterthrush along the Wissahickon. Photo by Ken Januski. I do hate to crowd a post with photos like this. 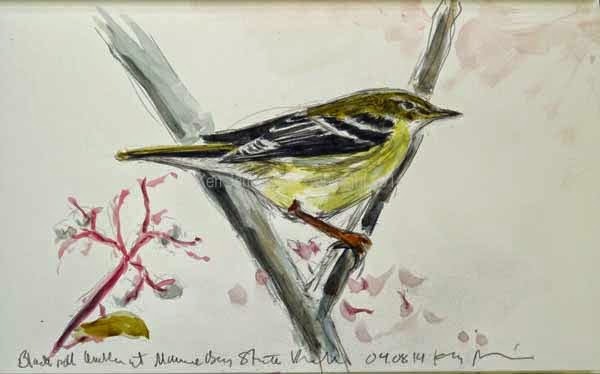 But my attempts with a watercolor sketch that combines a Louisiana Waterthrush and an Orange-crowned Warbler the other day upon first seeing them just didn't turn out. I just couldn't convince myself to show it. 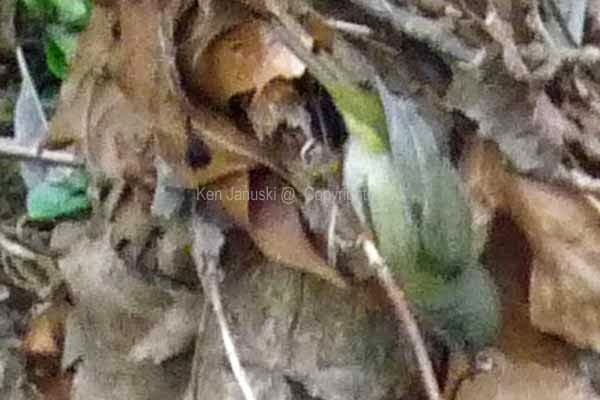 But given that it seems to be a bit unusual to find an Orange-crowned Warbler at this time at this location I decided to go out again, this time bringing Jerene along. We started off by finding a Winter Wren and a Hermit Thrush but no Orange-crowned. Thankfully we didn't give up. He eventually reappeared and I took upwards of 25 photos. The best are here. Since we were looking straight down at him most of the time the photos don't show everything that you might need to confirm the ID. Because of that I've tried to include photos that show pertinent parts of this bird we rarely see. 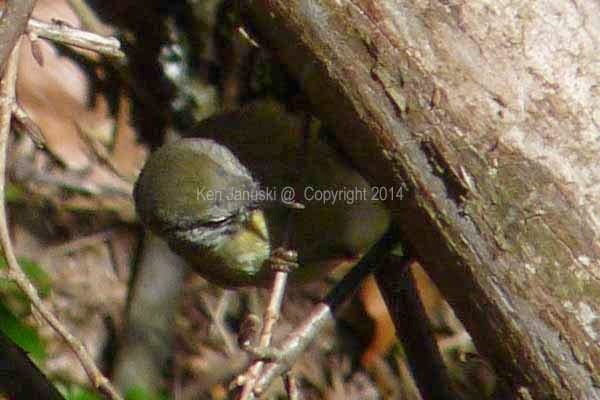 On the way back up the hill we saw warbler number five for 2014: two Palm Warblers. I don't think there's a more beautiful yellow in the American bird world than that of the Palm Warbler, though I'm also very partial to that of the Yellow-breasted Chat! Combined with the Pine, Louisiana Waterthrush, Orange-crowned and Yellow-rumped Warblers that we've seen you could say that spring finally, finally, finally has arrived. In our yard the first buds of Bloodroot have poked their head up an inch or two. A very exciting two months lie ahead.